I was thinking that this blog can be of interest for other different able people, so I will try to explain a bit of how my body works. In 2003 I had an motorcycle accident and got a spinal cord injury. The injury is incomplete and at level Th3. I can stand on my feet, not for a long time, but enough that it is helpful in many situations. I need to hold on to something because my balance is not so good. My body has also big difference between my right and left side. My left side is the strongest for movement and my right side is best for sensibility. I can actually lift my left foot so I can walk stairs, one step at a time. For the daily life I use a manually wheelchair from Panthera U3 light with a SmartDrive and a FreeWheel. 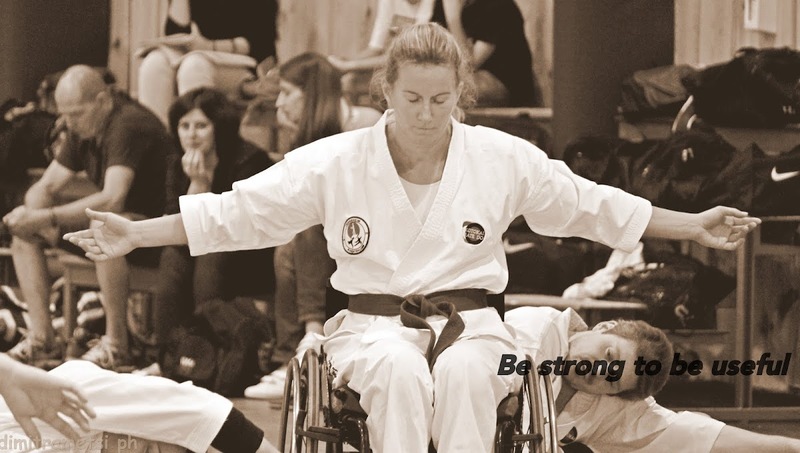 This equipment is perfectly for an active life in wheelchair. My car, a WV Caravelle from 2015, is fully equipped with an elevator in the back, and two electrical side doors. As I can stand I can also use the side doors for lifting my wheelchair inside and then go up the extra mounted step to get inside my car. I use a handle for managing the gas and brake pedals. And I have an adaptive cruise control! That is the best invention ever! It works perfectly so I can keep my patient even when I meet not so good drivers on my way, haha! Other things to know? I am working in a hospital laboratory as a bioengineer, well, now I have permission from work for a year, but I plan to come back to my great colleges in November 2018. Until then I will stay in Italy for training my body to get stronger so I can manage to do my work even better. 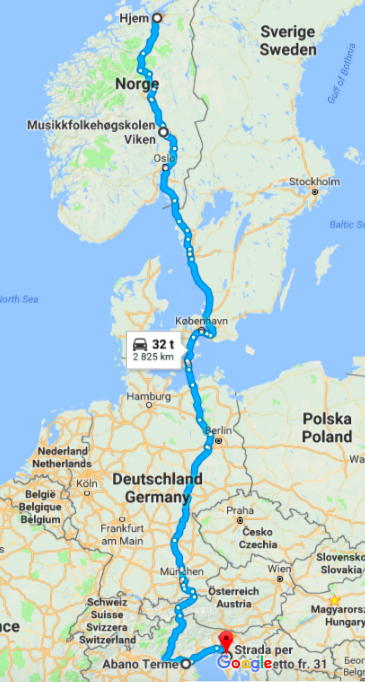 Google maps says there are 2 825 km from my home in Trondheim, Norway until my Italian home in Muggia, Trieste... a long way of driving. I had some stop outside the route that made the trip a bit longer, but in all, a really long time on the road. 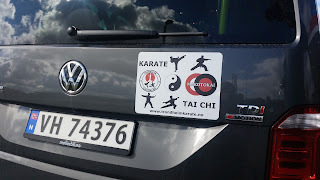 Luckily I love to drive my car, a VW Caravelle from 2015, fully equipped for a wheelchair user, and a bit more. For a long trip like this I feel it is necessary to have an adaptive cruise control to help release some of the tension of holding to the driving stick. And of course a German car is really perfect for the German Autobahn! I used the trip to combine it with a seminar for a project I am leading - #hjulbeintkampsport. We held our first meeting in Gardermoen, Oslo, so we were four people together with a lot of luggage - A LOT! driving from Trondheim to Gardermoen. Staying a year in a new home I actually did not bring so much, but my big car was so full I could not use the elevator. Luckily I had really good help from my passengers. 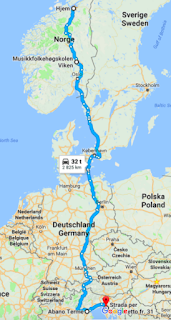 And for the trip from Oslo we where also two people, so we managed quite well - I drove and my passenger put fuel into the car, did some shopping for coffee and helped with my wheelchair. He even should help with the driving but as I told you, I love to drive. The first day I drove all the way to Hotel Gremersdorf. We found the hotel at booking.com, right by the main road from Puttgarden. The hotel was good, and it has both parking and a restaurant. I got a room equipped for wheelchair and it suited me perfectly. You can read a bit of my function in a new post coming up soon. The next day we drove all the way to Abano Terme, Italy. We were lucky there was not much traffic and the weather was nice. The second day was really tough, and I would probably had taken one more night if I was alone. 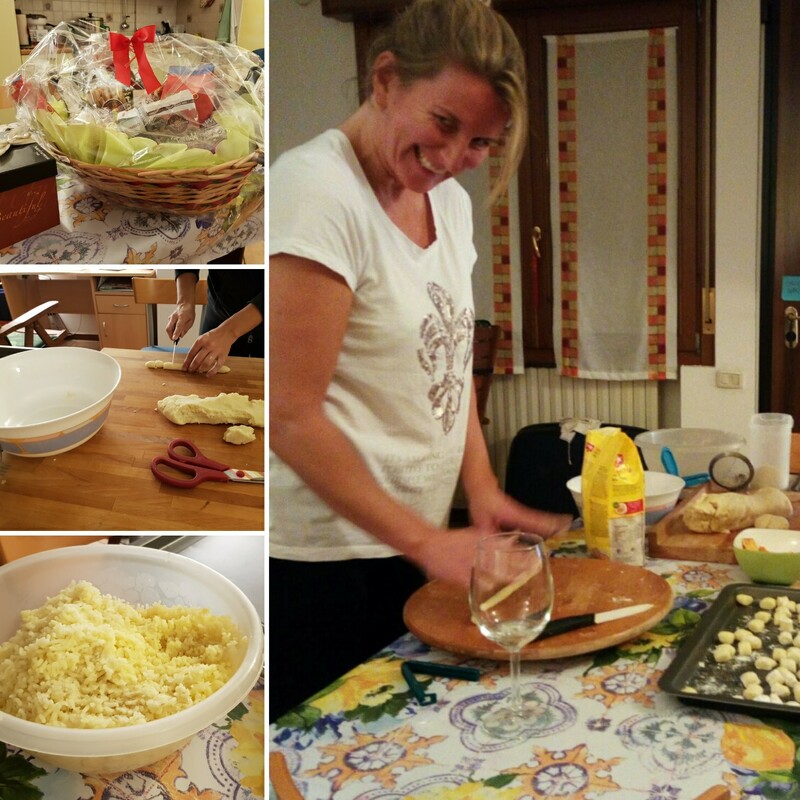 I stayed with my friends in Abano Terme for two days, and I was so lucky to have a family dinner! I even learned to do gnocchi! Really wonderful even though my Italian are not good yet.